Be your best on the most challenging trails. Climb technical steeps and rail descents with confidence and speed. 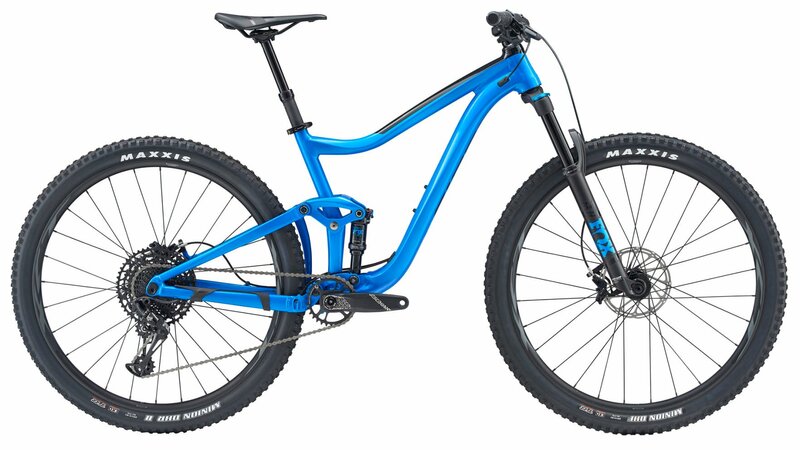 This all-new alloy framed 29er features reengineered rear suspension and progressive geometry to help you up your game. This super-versatile trail machine is built on an all-new ALUXX SL frameset that blends Giant's latest Maestro suspension technology with progressive, trail-oriented geometry. To soak up every bump, from big rocks to small undulations, they gave it a trunnion mount shock and an Advanced Forged Composite upper rocker arm. This combination produces 115mm of smooth, active rear-wheel travel that puts you in control. Up front, it features a 130mm travel suspension fork, and the overall geometry has been tuned and developed to maximize its performance on rugged trails. The Giant Trance 2 comes with a host of capable components that will have you confidently charging your favorite trails. The NX Eagle drivetrain features 12-speeds and wide gear range that allows you to spin your way up steep climbs. A Fox Float Rhythm fork makes quick work trail chatter allowing your front wheel to track perfectly. Giant XCT wheels are tubeless ready and spin fast and smooth on sealed bearing hubs. When it comes time to slow things down, SRAM Guide hydraulic disc brakes will get the job done in any condition. Top it off with a Giant branded cockpit and the Trance 2 is ready to dominate any trail. Maestro suspension remains extremely efficient in a variety of conditions. Aluxx SL frameset features updated geometry. SRAM NX Eagle drivetrain with a large 11-50t gear range. Fox Float suspension for a plush ride. SRAM hydraulic disc brakes get you stopped on a dime. ALUXX SL-Grade Aluminum, 115mm of travel, 12 x 148mm rear spacing.